Betsoft has done all their fans a great service and released Sugarpop 2 : Double Dipped this week. The sequel to the feature packed original lives up to and exceeds the legacy left by its predecessor. A massive 7×7 reel layout, explosive animations whenever you strike a big wins and of course that very sweet 96.42% RTP all add up for a delicious pokie experience. Starting off the special features that BetSoft have included here, we have the free games feature. No pokie would be complete without one and in Sugarpop 2 you can win up to 27 free spins. This feature is activated by cluster wins of 4 or more of the red and yellow bonus symbols. Clusters refer to multiple matched icons appearing in groups. 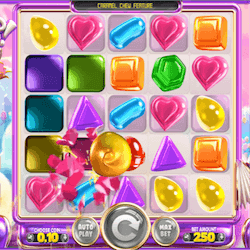 To make your wins even more rewarding, the Sugarpop 2 developers also included a cascading reels style feature where matched icons disappear from the reels after they payout, with the symbols above the win dropping down to fill the empty space. Just to make sure they have included every possible pokie feature, there is a Double Up game which is a gamble function. You can activate this feature after any standard game win to take a gamble on any amount you just won. You can potentially double that payout if you win a coin toss. The golden stars with the arrows on them are special symbols that when triggered in a winning combination increases the player’s level. The higher your slot level the better symbols and features are added to the reels. To raise your level from 1 to 2, you need to land 4 level up symbols in a cluster win, to go from level 2 to 3 you must land 6 level up symbols in a cluster win. Basically to raise your level you need to land the amount of symbols equal to the desired level plus two. Special features are added on level 1, 8,9,13,17,21,25 and 29. The special features added to the reels include the Candy Cane symbol which will explode all the symbols in the row and column it lands on. There is also the Jelly Bean Cannon on level 21 that fires a load of jelly beans onto the reels, destroying every symbol that touch and triggering a massive cascading reel explosion. Sugarpop 2 is an excellent entry into the series and well deserving of your time. Betsoft have kept the best features of the original and merely added more fun and nuance.